There is a thriving Urban Winery scene just waiting for you to discover it in the San Francisco East Bay. The surroundings may have more asphalt, warehouses, and freeway sounds than a rural wine country experience, but you can still find fermentation vats, oak barrels, and skilled winemakers selling quality products out of tasting rooms here. Since these Urban Wineries source their grapes from a variety of regions, wine tasting excursions to Oakland and Berkeley involve varietals ranging from Grenache Blanc and Riesling to Counoise, Pinot Noir, Sangiovese, Cabernet Sauvignon, Petite Sirah, and Zinfandel. In a good way. Just make sure to plan your trip to the East Bay well as the regular tasting room hours at many of these wineries are limited (your best bet may be to make this a weekend getaway). Headed up by Chris Brockway, this small winery in the East Bay focuses on wines that reflect their terroir. The philosophy here is that vineyards only develop their true character and complexity when they have to struggle to survive, and a wine’s true character comes from using only sustainably, organically, or biodynamically grown grapes from those vineyards. Old-school urban winemaking here means that grapes are pitchforked whole-cluster into the fermenters, fermentation is allowed to happen spontaneously, all wines are basket pressed, and little to no sulphur is used in the wines until bottling. This place is easy to miss with its ivy-covered façade so keep an eye out for their signs or listen closely to your GPS. 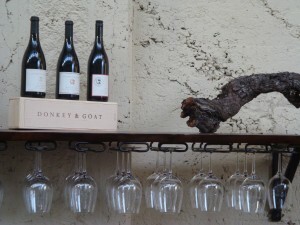 The artisan winemaking here excels and is a delightful surprise. We’ve generally preferred their red wines to their whites and highly recommend the Cabernet Franc, Carignan, Counoise, and Grenache here. Tasting Room open Saturday and Sunday, 1:00 to 5:00 pm. The Tudal Family draws upon a long history of growing and winemaking to create limited-production fine wines. Cerruti Cellars, in Jack London Square, is named in tribute to patriarch and 1st generation California Grower George “Baci” Cerruti, an Italian immigrant from Genoa that lived to the ripe age of 99. His legacy has passed down through Arnold Tudal (2nd generation) and John Tudal (3rd generation). Up in St. Helena, the Tudal Winery’s fame and reputation is based on their signature Tudal Estate Cabernet Sauvignon using grapes from the estate vineyard planted back in 1972. The Tudal Winery is only open by appointment but the Cerruti tasting room is regularly open to the public on weekends. We’ve had the pleasure of drinking the Estate Cabernet for years. More recently, we’ve also enjoyed their North Coast Cabernet Sauvignon, Clift Vineyard Cabernet Sauvignon, and Baci’s Bin (a Super Tuscan). The East Bay Tasting Room is open Saturday and Sunday, 12:30 to 5:30 pm. In 1996, winemakers and spouses Michael and Anne Dashe founded Dashe Cellars (he’s from California, she’s from France). Focused on crafting exceptional single-vineyard wines, Dashe Cellars blends the two winemakers’ combined 40-plus years of experience. The Dashes are some of the pioneers of the Bay Area urban winemaking movement and while they have a tasting room in Healdsburg as well, we prefer the tasting experience in Oakland. We’ve liked almost everything we’ve ever tried here – sparkling wines, whites, blushes, and reds. However, our favorites have been their Grenache Blanc, Improbably Chardonnay, Grenache Noir, Broken Leg Pinot Noir, Porquois Pas? Merlot, Perli Vineyards Syrah, and a red wine blend called Five Thirteen (Grenache, Syrah, Mourvèdre, Counoise and Cinsault). Tasting Room open Friday – Sunday, 2:00 to 6:00 pm. Stage Left Cellars (2102 Dennison Street, Oakland, 510-434-9930) Spouses Melinda Doty (owner) and Rich Williams (winemaker) head up this small but excellent winery where they start with a concept but don’t let themselves be limited by it. They handcraft small lot wines from their favorite Rhone varietals but play with other varietals when needed or desired. Only the best raw material makes it through to production. Stage Left Cellars lets Mother Nature do her thing (and then they try experiments on micro lots to see if they can outdo her). In addition to enjoying their California Petite Sirah, we are also fans of several of their blends: The Go Getter (Viognier, Granache Blanc, Roussanne), The Expat (Syrah, Petite Sirah, and Grenache, although some years the varietals may change), and The Day Job (Cabernet Sauvignon, Grenache and Mourvèdre). Tasting Room open only the 1st Saturday of the month, 11:00 am to 5:00 pm. A small room in the middle of a warehouse space in Oakland’s art gallery neighborhood, Two Mile is a pleasant diversion. The name? Back in the late 1800’s a delegation of state legislators visited UC Berkeley and witnessed a group of undergraduates who had been drinking, This ultimately resulted in a law prohibiting the sale of alcoholic beverages within two miles of campus. Luckily, this winery pours and sells their wine a safe 4+ miles from UCB. The owners here make wine in Oakland with grapes purchased from growers in Sonoma, Napa, and the Central Coast areas. Of the wines they make, we liked their Sangiovese and Founders Rock (Petite Sirah and Syrah) the most. Tasting Room open Saturday, 2:00 to 6:00 pm. Urban Legend Cellars is a classic Mom and Pop business with Marilee and Steve Shaffer filling those roles. The wines made here tend to bring forward the true fruit flavors of the grapes, in a balanced framework of firm acids, round tannins, and very light oak. If you’ve been searching for a good Teroldego or Petit Verdot, drive on over to 2nd Street here in the East Bay. They make small lots of many different wines here, and we have been impressed by many of them: Lake County Sauvignon Blanc, Lake County Riesling, Rosata di Barbera, Holland Landing Vineyard Barbera, Undici (Sangiovese/Cabernet Sauvignon blend), Teroldego, and Petit Verdot. Tasting Room open Friday – Saturday, 1:00 to 6:00 pm.